Purchase and sale of originals. Sale hergé lot n ° 225. 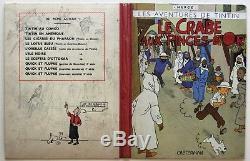 Golden claw crab cover project by hergé. Indian ink, graphite and gouache for the cover project of the large-image edition of the crab with gold tongs published in 1942. This piece is mentioned in the chronology n ° 4 of philippe goddin page 213. It is an exceptional museum piece, historical, linked to the genesis of the famous nine large color images. The first dish is a montage made by the publisher with the third off color text of the album, on which were glued 2 banners bearing the name of the author and the series "adventures of tintin". This assembly was sent to hergé in mid-March 1942 so that it makes tests in the perspective of the passage of tintin covers in large format images. 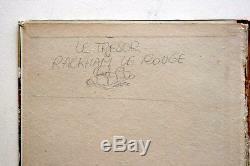 Hergé raised it to lead pencil, drew a title essay in red and inscribed the name of the editor at the bottom. He gave up this option after this red test, preferring a white title better standing out on plain blue background from the cover drawing of the small picture edition. The 2nd dish has 13 is widely decorated with various sketches and successful including several trials riders galloping. It is likely that the sketches date back to 1944-45 because of another pencil sketch on the back of the first plate representing the title band project of the album "Rackham's Treasure the Red". Do not hesitate to contact me if you want more photos or additional information. Hand delivery possible in Belgium, Lille and Paris. Come to discover on our site all the comic collection. Payments by bank transfers, checks (collection period). The item "sale hergé lot 225 project crab cover with gold pliers 1942" is on sale since Sunday, October 14, 2018. It is in the category "books, comics, magazines \ bd \ boards, original drawings". The seller is "bd-art-gallery" and is located in / in lille. This item can be shipped to the following country: europe.